Situated in Pigeon Forge’s Sherwood Forest, an inviting cabin community with pool access, Slice of Heaven is a gorgeous new construction that’s sure to impress inside and out. 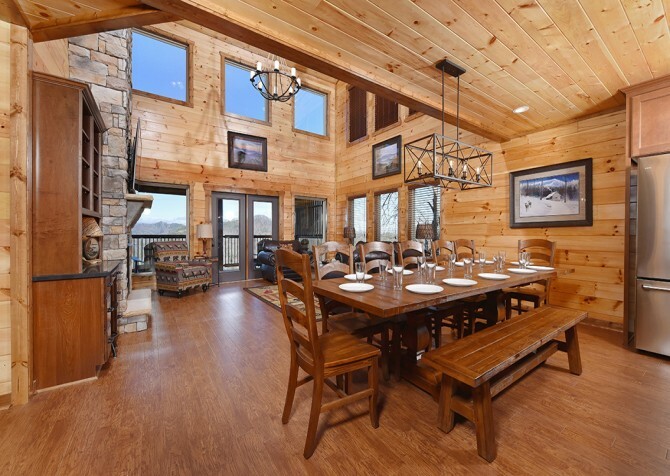 The 5-bedroom, 6-bathroom cabin for 16 is approximately 4,000 square feet and outfitted for all types of groups, from families to friends to coworkers. With its blend of fun perks, convenient amenities, expansive space, and modern style, it’s definitely the place to call home in the Smokies. Across the 5 bedrooms, find 4 king-size beds, a queen bunk, and a twin bunk (all with their own flatscreen TVs) — a great mix for any group. There’s also a queen sleeper sofa in the rec loft for a little extra sleeping space. The fully equipped kitchen has the appliances, tools, and dishes you need for group meals; and conveniences like a washer and dryer and wireless internet make stays even easier. 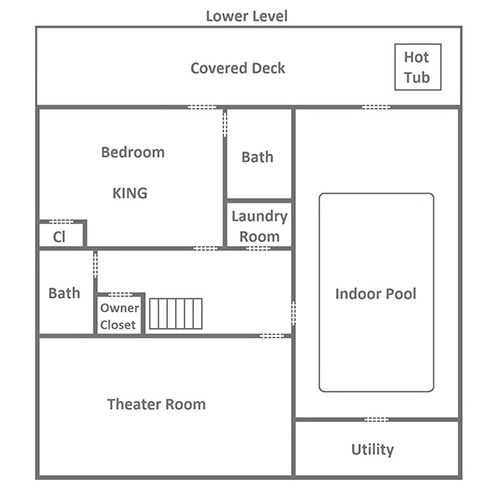 Possibly the stars of the show are the private indoor pool, the awesome game room, and the private home theater! Now that’s how you entertain a group. Check out movies on the Blu-ray player and big screen TV; splash around in your own pool year-round; and play pool, board games, and arcade favorites like Golden Tee 2018, and more! 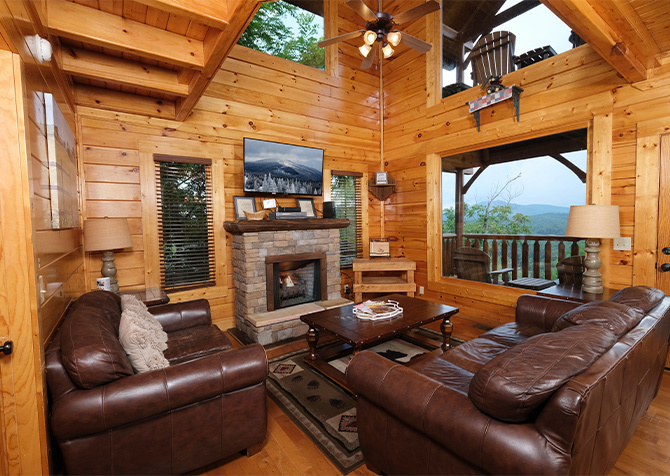 And don’t forget the great outdoor spaces, with spectacular mountain views, rocking chairs for sipping coffee or cocktails at the end of each night, a gas grill for classic mountain cookouts, and an outdoor hot tub where you can soothe those tired muscles after long days. 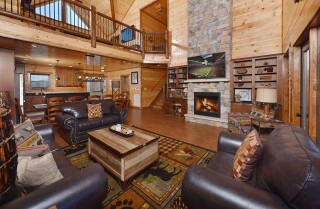 This large-group lodge in Pigeon Forge is undoubtedly a Slice of Heaven in the Smokies. Welcoming you home with stunning mountain views, large windows, sky-high ceilings, and cozy furnishings, the living room itself is a Slice of Heaven! Flip on the big screen TV, plop on the sofas for a snooze, or head straight for the fresh mountain air on the covered deck. When the evening sun sets, change into your jammies, whip up a fresh batch of cocoa in the nearby kitchen, and settle in for chats with your friends by the stone (gas) fireplace. The mountain decor, hardwood floors, and massive chandelier really elevate the space, creating unbridled Smoky Mountain charm. And there’s even a built-in desk space, perfect for checking emails or jotting down a journal entry. 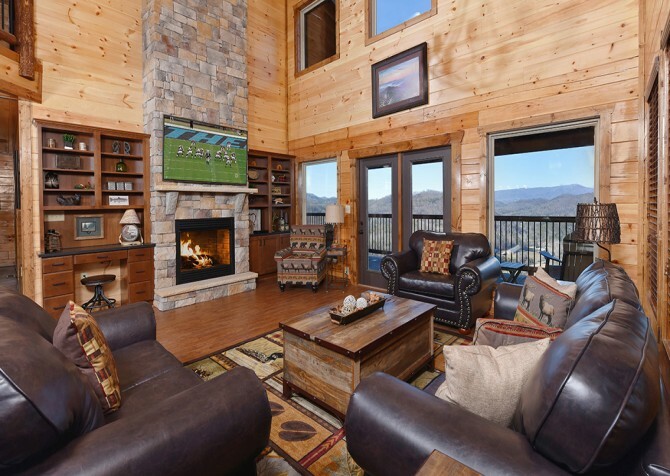 With an open concept throughout the home, you won’t miss a Smoky Mountain view in the nearby kitchen, fully equipped with stainless-steel appliances (including an oversized fridge) and loads of cooking tools plus dinnerware. Warm wooden cabinetry mixes with stylish countertops plus a bonus island to create a dreamy prep space, where you can whip up grand feasts or quick meals in a flash. There’s even bar seating for 3, great for feeding early risers or letting the little ones help decorate homemade cookies. And let’s not forget everyone’s favorite kitchen feature — the handy dishwasher! Nestled between the living and kitchen areas, the dining area seats 12 with a large country-style table that features 7 chairs plus a matching bench. Combined with the living room seating and kitchen bar for 3, everyone will have a comfortable place to dine with family and friends. After meals, clear the space and play board games provided by Slice of Heaven. When the victor is crowned, celebrate with a special ice cream treat in summer or warm apple pie in winter or go for both together year-round! It’s game time in the loft — with top-notch mountain views (literally)! Play chill rounds of pool with friends, teach Ms. Pac-Man and Donkey Kong a thing or two on the arcade unit, try out some Golden Tee golf, play shuffleboard, and bust out a few cold ones with your pals at the cocktail table for 4. Or go for classic board games, like Scrabble, Jumanji, and Pictionary. There’s also a mounted flatscreen TV, 2 ceiling fans to keep cool, and a plump sofa that doubles as a queen sleeper, perfect for the youngsters who pass out after playing. 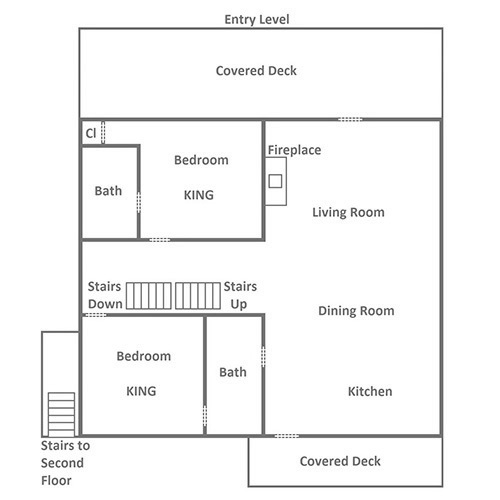 Downstairs you’ll find a great space with a private indoor pool and mountain views, too! Relax and unwind in the Adirondack chairs while the kiddos play around or go for a relaxing night swim with family and friends. Smell the buttery popcorn and hear the pop fizzle — it’s movie night in the theater room! Get ready for booming action scenes and enhanced dramatic moments with surround sound plus stunning scenes on the big screen TV. The room is theater style, with side lighting, tiered seating, and drink holders. Lean back in your cushioned chair and settle in for feature films on Blu-ray. After playing all day, swimming in the evening, and watching a movie marathon, sweet sleep will be just what you need. And what better place than a king-size bed, harbored in 4 bedrooms! Or head to dreamland on the queen or twin bunk in the 5th bedroom. 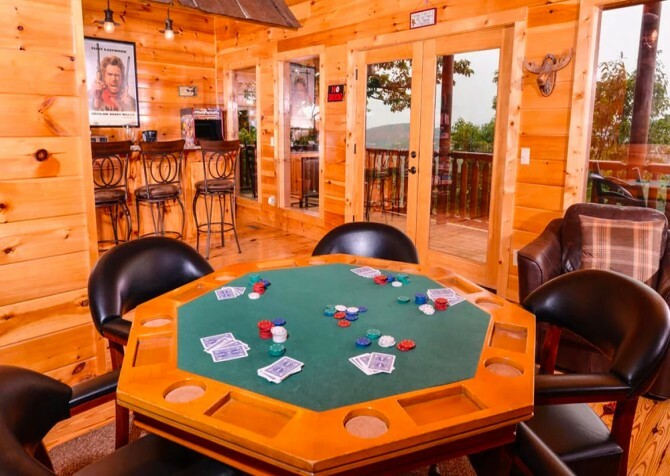 Direct deck access leads to mountain scenery and fresh air in 3 of the king bedrooms, and mounted flatscreen TVs can be found in all 5 bedrooms! 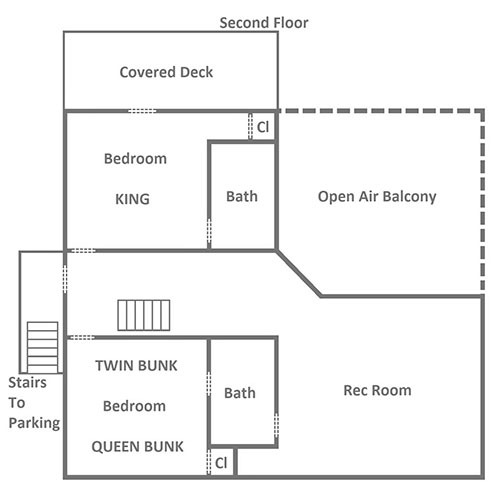 There’s also a queen sleeper sofa in the loft for extra guests, meaning Slice of Heaven can sleep up to 16 comfortably. And the 6 bathrooms boast a modern style and chic design with stone-tiled showers, a few with a bathtub combo for spa nights or bubble baths for the little ones. For a real Slice of Heaven, head onto the back decks, where beautiful mountain views extend for miles. 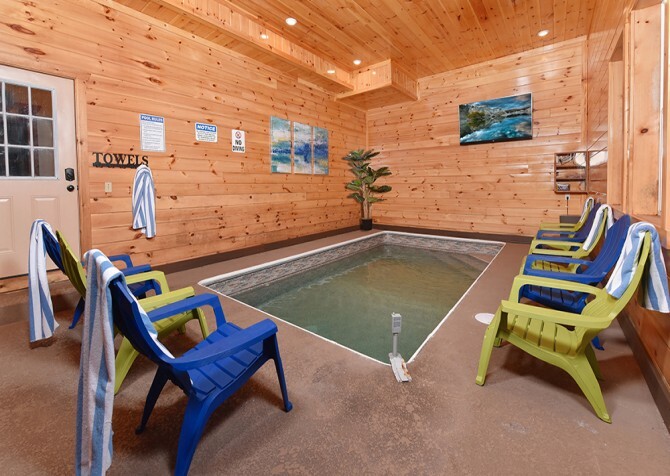 Rock away your worries and cares with a cup of joe in a rocking chair or slip into your swimsuit for a soothing soak with nature in the bubbly hot tub. When you’re ready to paint the town red (just a few miles away), head to the paved driveway with a motorcycle-friendly parking area for up to 4 vehicles. The best part? There are 0 steps, meaning gathering everyone into the cars will be hassle-free. After shopping at unique boutiques and playing at local attractions, return to the cabin for a barbecue feast with the gas grill! What else will you find at Slice of Heaven? There’s a provided washer and dryer so you can pack light and complimentary Wi-Fi so you can post photos and videos of your national park adventures whenever you please. 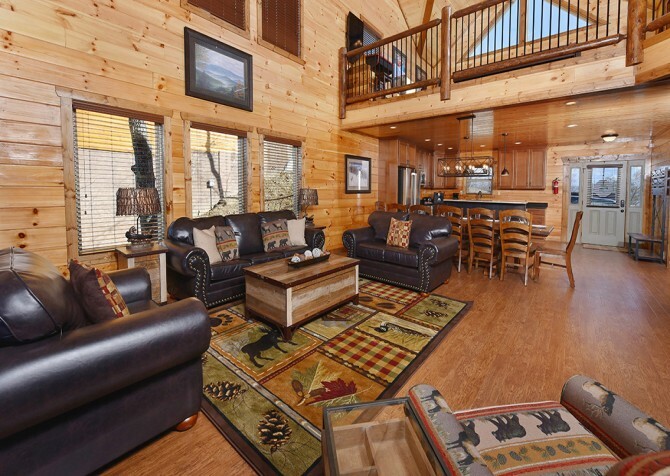 As a super bonus, when you stay at this Pigeon Forge cabin in Sherwood Forest Resort, you’ll have full access to the community pool — splash and sunbathe all day in summer! 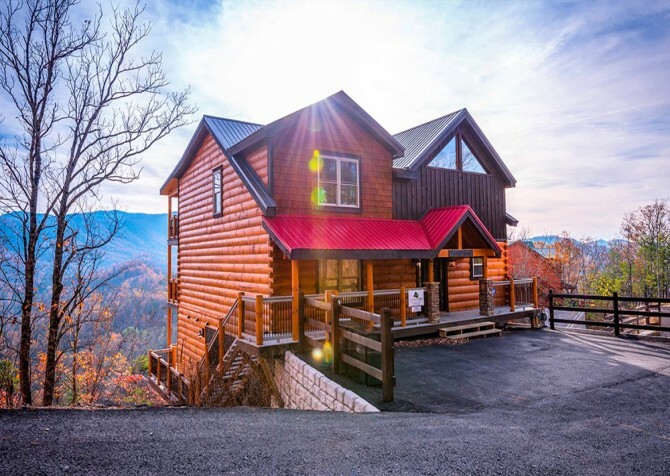 Not only is this cabin a true Slice of Heaven with so many accommodating and fun amenities, it is also a convenient location to easily head to downtown Pigeon Forge for go-kart racing, ziplining, mini golf, shopping, dining, and more — less than 3 miles away! Zoom, swerve, and speed round The Track Smoky Mountains, featuring go-karts, bumper rides, kiddy rides, a merry-g-round, and an arcade! Dine on Southern staples and watch an exciting, horse-stunt-filled, comedic, musical show in the arena at Dolly Parton’s Stampede, a famed dinner show in the Smokies. Release your inner warrior on the Fire & Ice Ninja Course, play trampoline-infused basketball or dodgeball, climb to great heights, beat the highest arcade scores, and take home a trove of candy at TopJump! "Everything in the cabin was perfect. My family had a wonderful time. We will be next year!!" Thank you so much for the great review! We are so happy to hear you and your family had a wonderful time. We are looking forward to helping you with your trip next year! "I stayed at Slice of Heaven and the name perfectly describes this cabin! The living area is so spacious and the beds were GREAT!! I will definitely stay with Cabins For You again!!"